Fruit Ninja is one of those must have games that is entirely too addictive for your own good! 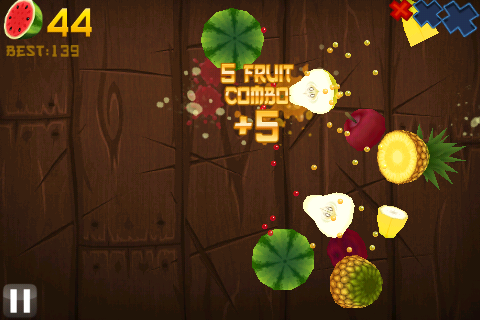 The goal of the game is to slash as many fruits in half as possible and to beat your best high score. This is simply one of the best casual games out for the iPhone! There are two game modes currently: classic and zen mode. The goal in classic mode is to slash as many fruits as possible without slashing any bombs or allowing 3 fruits to drop off of the screen untouched. Zen mode is a more relaxing mode that does not have any bombs, untouched fruits that drop off of the screen do nothing, and you have two minutes to slash as much fruit as possible. You can gain extra points by slashing 3+ fruits to ear special bonus points and then there is a random critical strike that gives you an extra 10 points! There are OpenFeint achievements and leaderboards to keep you challenged. The in-game achievement notifications are by far the best looking customized notifications that I have seen in any OpenFeint game. The developers are Halfbrick Studios really made sure that everything about this game was perfect. This is a very polished game that is really a blast to play. When I first saw this game released I thought to myself that this would be a flop, but playing it completely changed my mind and it is well worth giving a try! The creators of Edge have created a very interesting and unique puzzle game that is very well polished. Cross Fingers is a game where you create a tangram out of several smaller shapes. You move the shapes around by simply dragging to the desired location. There are sometimes fixed and movable obstacles in your way that make moving the shapes into place much more challenging. The puzzles are broken into 4 difficulties: easy, normal, hard, and pro. I found the puzzles to start getting more challenging once you reach the hard levels. 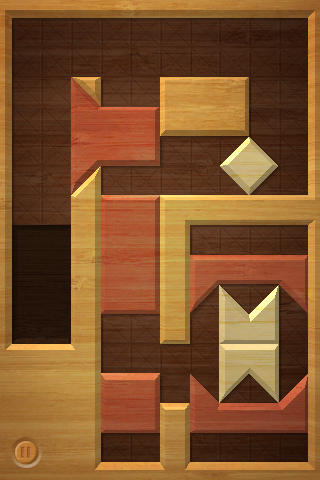 The game includes 120 levels and then you can also unlock an arcade mode where you really have to think quickly as more and more shapes are added to the board and you have to solve a tangram to remove shapes from the board. The normal game mode has a very relaxing feeling while the arcade mode is for those that really want to keep their brain in motion! The artwork and sound fit the game very well and Cross Fingers is a typical Mobigame that is very well polished. There is a ton of reply value in Cross Fingers and this app is top quality! There is not much that would make this game better, so I would recommend checking it and all of the other Mobigames out. 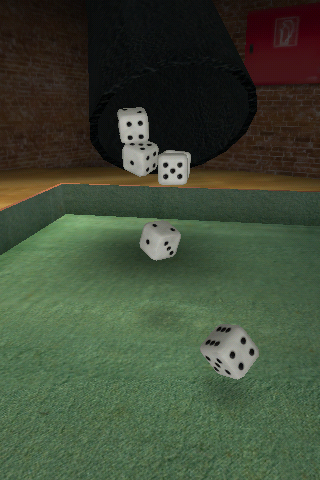 Newton’s Dice 3D by Mark Hessburg is a dice app that also offers two different dice games. The graphics are beautiful with a 3D environment that fits very well with this type of game. You can either choose to use this app in place of physical dice or play one of the two games that it offers: Dice 10000 and Shut the Box. You role the dice by shaking the iDevice and then they will be thrown out of a cup onto the table. I am a little old school, so I am not sure that I would ever use an app to replace physical dice, but the two included dice games were a lot of fun. I really enjoyed the 10,000 game mode and thought the scoring and AI were well done. There is also a mode that will allow you to play with up to 4 other players locally (i.e. pass-n-play). This game might benefit from adding a wager aspect to keep things interesting, or an online mode that would let you play against your friends in a Words With Friends manner. Very nice dice game worth checking out and it is currently 80% off. Today we bring you an indie interview with David Papazian, the creator of Edge! We develop for the iPhone OS since September 2008. Before that we were working for other mobile handsets. Me (David) and my associate Matthieu Malot met at Gameloft in 2002. How long did it take you to develop Edge and how many people were involved? How did you come up with the idea for Edge? Matthieu had the idea a long time ago. He was looking for something very simple, something intuitive, and one of the core idea is that everyone played with a cube when he/she was a kid. What inspired you for Edge from initial concept to formalized game? The initial concept was a cube moving on its edge with a kind of analogic control. We thought a lot about the level design, the atmosphere, the graphics, the difficulty curve. Matthieu wanted something very pure, very polish. Some ideas like the mini cube come from the game Kid Dynamite, and one name came very often in our discussions: Tron. I guess you know this movie, if you don’t you must watch it! We make the games we want to play. For now, Matthieu and I made 2 games: Edge and Cross Fingers. Both ideas come from Matthieu, and for the next games I am more involved in the game design. We share our ideas and we try to keep only the best ones. Matthieu is a Sega fan, and I am a Nintendo boy. You are dependent on the distribution channel, and you don’t have anything to say. For example, we had a legal issue with our game Edge last year. This year EA had exactly the same issue, but Apple did not react the same way with them. Indies are very dependent to the big companies, we have to follow and take opportunities. In a way it is great, but we have no security. Big companies do not share their secret about the future of the industry with us. It is very simple. When we have an idea we make a prototype. If we like it we push it further, we add news ideas, we keep only the best ones. We can call this iterative game design. It is pretty long, and you don’t have the full game design at the beginning, but at the end you may have a great game. Our team is very small. We were only 2 on Edge, and today we are 5. I mean, with a small team everyone give his ideas. When everyone is enthusiastic we try it. Sometimes we play old games which could answer to some questions more quickly, but in the general case we try all ideas. The initial stage is very exciting, everything is still possible. But for us the most important is the gameplay. Everything in the creation process must help to improve the initial gameplay. Did you do any pre-marketing before Edge was released? Not really. We released a video on YouTube one week before the release, and I sent an email to some journalists when the game was released. We have just finished a new game. It is a very fun old school racing game for the iPhone. Now we are finishing another game, a very ambitious one. it is 3D game with lighting effects and physics and a very innovative gameplay, still for the iPhone. We are also porting Edge for the PSP and we are working with another company to bring Edge on the Ds, Wii and PC. Any plans for updates to Edge? There are many options, we want to do more levels, but we also want to add new gameplay elements. We also want to improve the graphics. Should we do a HD version for the iPad with more levels? or should we do a sequel with a lot of new stuffs? Anyway, we have a lot of idea and we will continue to work on Edge. What was your most frustrating task while developing Edge? We worked with iterative game design. But at some point, you cannot add new ideas easily, because it will need too many changes in the engine, or because you have to release it soon. At this point you start to think “ok let keep this for Edge 2”, and you hope there will be an Edge 2. The final stage was the most frustrating. What have you found to be the most successful way to market Edge? The awards, or the video. I mean, the game won some awards before its release, it was announced as a triple IGF finalist when it was released so I am sure that helped. Also the video, Ninomojo made an amazing soundtrack for the video (Kakkoi) and the trailer has been seen more than 100,000 times in the first 2 weeks, that’s pretty good, but this video is unique, the game is innovative and the music is great, it is not something easy to reproduce, and Apple promoted the game on the store. A lot! We answer to all our customers’ emails, we do our best to make our games better. For example, we add 2 controls types to Edge because our customers asked for them, and we add 20 levels since the initial release! I think it was a good move, some companies prefer to make a sequel, but making a free update create a special link with our fans. For future projects we are looking at where the market goes, what people want, and what we want to do, and we try to fit everything together. But we also want to surprise our customers, one of our next game is something never seen before on the iPhone, we don’t know how people will react, but we have a lot of fun with it. We try to have a good mix between artistic and commercial games. It is a hard one. We write games that we want to play, but we write them for others, because we want to share what we like. I will give an example, When Matthieu makes a new level for Edge, I am the first tester. And Matthieu look at me when I play it, sometimes I laugh when I die in a trap, or sometimes I feel it’s too hard. It was the same with the sound design. Each one of us make his partition to share it with the team, and the team make the game to share it with the world. I hope it makes sense. We have no secret for that, we take our time, we stay away from the game and we wait until the solution find its way through our minds. We would do everything the same way. What was a must have during the development process of Edge? Rubik’s Cube, and not only one! You need a minimum of two of them to simulate all mechanics. And you can also use it to relax, yes solving a Rubik’s Cube when you know the algorithms is very relaxing, for me at least. What games influenced you in your decision to make Edge? None. And that’s probably why Edge is unique. During the creation process we thought to some games, we also find out some other games featuring cubes, like Cube on PSP which was released after we started working on Edge. But no game influenced our decision to make Edge. The end product is really really better. The gameplay goes really further, especially with the “Edge Time” which was not present in the initial concept (it is when you hang on the Edge of a moving block to cross a gap). We are also very happy with the esthetic, the shade of grey of the levels with the colorful cube. At the beginning the cube was only blue, the levels were made of white and grey blocks, and the background was white. But one thing did not change, the cube and the way it moves. Before the release of Edge were there any huge last minute changes? Not really, we took 2 years to make it, and we released it only when we were happy with it. We polished it until the last minute. There was no deadline, so no hurry at the end. We trust in our potential, we believe we are doing good games and that’s enough to keep motivated. It is easier when you are not alone. When Matthieu make a great design, or when the musician make a great tune, or when I add a great feature in the game, everyone else is more motivated than ever. It was really important. Some people does not understand it, they said we should have added a blue sky, grass on the ground and this kind of stuff to make it more casual like a Popcap game. But Edge is a piece of art, it has his own esthetic, and I can say that because I am not the designer. Matthieu had a vision and it is exactly what you can see and listen to in the game, there was no compromise. The code was made with Emacs (a free and powerfull text editor) and Xcode. The art were made with Promotion 6 (I highly recommend it for pixel graphics). The music were made with different tools, Cubase, Fruity loop, etc. For the levels and other tools we made our own software with Visual Studio. If I could take a game, I would play Heroes of Might & Magic 3, it is one of my favorite game of all time. And if you give me a C++ compiler and Promotion, I will probably code a lot of strange games or effects, that’s my demomaker side. Our industry is changing. Indies are becoming more important, and we need some people who will help to connect developers, together we are still indies, but we have a voice that our industry’s leaders will listen to. When we add all our legal trouble last year, The Chaos Engine and IndieVision helped us a lot, and we discovered that developers were a kind of family. That’s important to me, and that’s why I really thank you for what you are doing here at IndieAppolis. We want to thank David for his time and the great work that he and his team are doing! The name of the game says it all: Dogs Playing Poker! You are a dog playing Texas Hold ’em against four other dogs. The graphics, sounds, and gameplay are absolutely excellent! The concept of the other players being dogs really gives life to what would have otherwise been another card game. You start off the game playing a tutorial round, which is one of the better tutorials that I have seen in any game in awhile. You are even given an option to bail from the tutorial once you have learned the basics or stick around for some more advanced instructions. 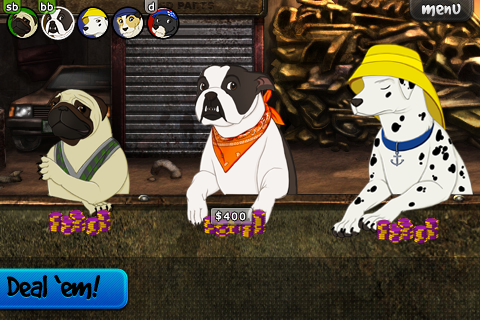 The game offers everything you would expect for a game of Texas Hold ’em, but the dogs are a really great twist. Each dog has it’s own tell, so pay attention and learn each tell. There are quite a few different locations and also unlockable dog breeds. The game has really good AI that can adapt to your playing. There are online leaderboards and various ways to brag about your poker skills. This is simply a great game that is a steal at the current price of $0.99. The various dog personalities and the great gameplay make this a game that will be worth playing for a long time! 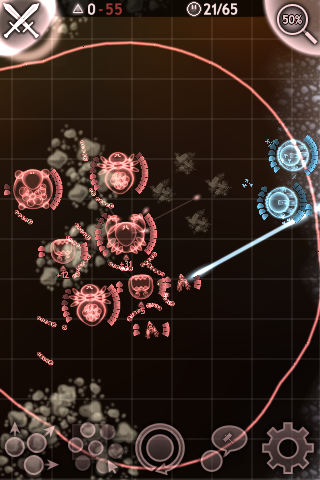 Red Conquest is a real-time strategy game that is chalk full of story, features, and fun! The game is easily worth $3.99 and now includes both Episode 1 and Episode 2. This is simply the best RTS game for the iPhone! You need to invest some time to really grasp all that this game has to offer. The game was actually a bit confusing to me at the beginning and the tutorial felt more like an advanced level. I was still trying to grasp the story, controls, and such while the tutorial level made me feel like I had fallen behind in class a bit. I kept with the game and actually after the first 3 levels I really started to enjoy the game. I do not typically like the space setting for RTS games, but I really got into this game. There are interesting cut scenes between levels and they are a little hard to follow at first, until you get a better grasp for the story. The controls are really great, once you get the hang of them. There are a good number of unit types and learning how to properly control and filter the different types of units is key to success. Make sure you take the time to visit all of the different “Tutorial Screens”. There are three modes of gameplay: Campaign, Challenge, and Local Multiplayer. This game would be a blast in a little LAN setting! The graphics and sound are well done. I would recommend this game to anyone that is a fan of RTS games. You should give the game a try now while it is on sale for 50% off the normal price!